I read this article and found it very interesting, thought it might be something for you. The article is called Short Of Land, Water, Education; Not Aspiration: Babban’s Story and is located at https://archive.indiaspend.com/cover-story/short-of-land-water-education-not-aspiration-babbans-story-11730. After two successive years of drought, Babban Chavan, 25, a farmhand and owner of 10 goats and two cows, left his family behind and migrated 550 km from his home in arid Latur in southeastern Maharastra. Working in Mumbai’s construction industry, he earned Rs 900 every day, triple the Rs 300 he earned back home. Clad in denim, white tee shirt and possessed of the self-confidence of a Mumbai collegian, Babban Chavan, 25, looked distinctly out of place in the ragged tarpaulin-and-bamboo migrant camp that houses drought refugees in the teeming central suburb of Ghatkopar. The attire and confidence belie Chavan’s reality. A farmhand and owner of 10 goats and two cows, Chavan started worked from age 15 in itinerant jobs as a farm labourer, moving from an unskilled bigari construction worker to mistry, a skilled construction worker, before two successive years of drought—the most severe in 30 years—forced him to leave his wife, four children and ailing parents and travel 550 km northeast to Mumbai. Travelling by train alone as he had a permanent reservation in trains due to a leg handicap, his family travelled by private buses. He journeyed this January from his village, Kaulkhed, in Udgir taluk in the southeastern district of Latur in the heart of drought-hit Marathwada. That’s 200 km longer than the journey a much-publicised water-train made from Mumbai to Latur city in April. A 5th-class pass, Chavan is young, strong and driven. He wanted to rebuild his home and be at home for the entire year. He wanted to move up from being a mistry to a supervisor at a construction site. He wanted his children to be graduates and to find a job in a city. “Amchi paristhiti poranvar nay yeu denar (I do not want my children go through conditions I am going through)”, he said. In Mumbai, Chavan earns up to Rs 900 every day as a skilled construction labourer. “I probably earn more than anyone else a day here, more than the unskilled workers who here form a majority, and three times the Rs 300 I earned in Udgir,” he said. Chavan and family are among the thousands of migrants who land in Mumbai and other cities every year, their numbers exacerbated this year by the record drought in Marathwada. 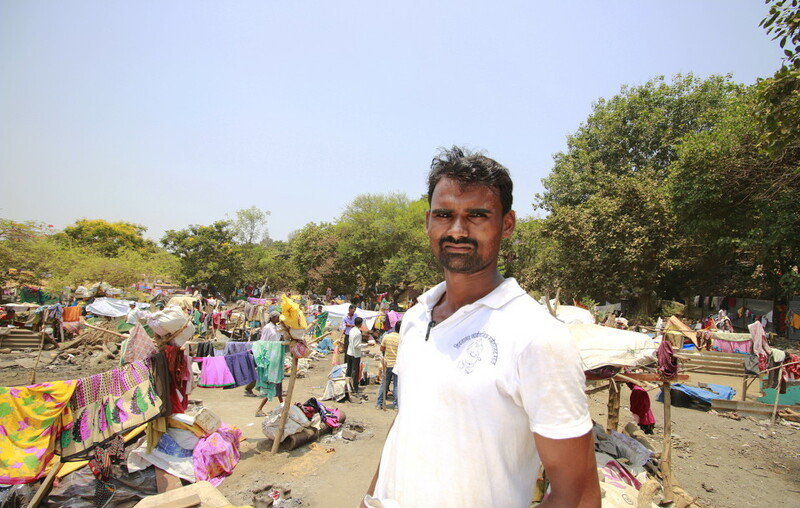 Here at their temporary home in Ghatkopar, their income from mostly construction jobs has taken them from below the rural poverty line to 82% above the urban poverty line, we reported in the first part of this series, an IndiaSpend survey of Marathwada-to-Ghatkopar migrants. The third part will explain why the number of migrants in Ghatkopar is five times above normal, fuelled in one taluk (an administrative unit smaller than a district), by the failure of India’s national rural jobs programme. Our time among Chavan’s family and others like them in Ghatkopar revealed how partial education left them unprepared for modern jobs and made migration a vital part of their survival. But their existence at the bottom of the pyramid did not stop their aspirations, as their phone ownership indicated. * No more than a fourth of migrants are educated above seventh standard. * About 60% of migrants own mobile phone, but only 5% use smartphones. Most of the Ghatkopar families are Banjaras, a quasi-Hindu tribe. The migrants anchor themselves to the sugarcane cycle, migrating south from their villages in November to harvest cane and earn a lumpsum of about Rs 50,000 for the family in the four to five months following the monsoon. In summers, they settle in big cities (for another four months) to get temporary but relatively high-paying jobs in construction sector. This time, the cane harvest season was cut to two months on account of empty dams making irrigation impossible, so many of them earned half the income of past years. They had no option but to land in Mumbai in January, 45 days ahead of schedule. 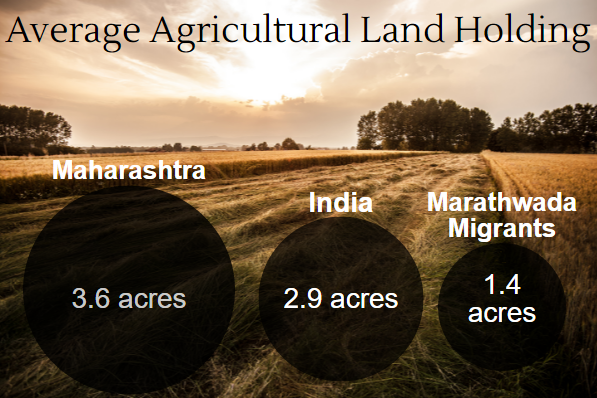 About half the migrants we surveyed owned 1.4 acres of land, half the average land holding in India (2.9 acres), and less than a third of the average land holding in Maharashtra (3.6 acres), according to the Agricultural Census 2010-11. Source: IndiaSpend Primary Surveys – Migrants In Mumbai, May 2016; Agricultural Census 2010-11; figures in acre. Back home, none of the migrants had wells or bore wells or access to irrigation. Only half of them owned cattle, an average of three to four (cow, buffalo, goat) per household. “We saw a rapid influx of families coming for the first time, due to back-to-back droughts in Marathwada,” Deepak Hande, municipal councilor of the area where the migrant camp is set up, told IndiaSpend. 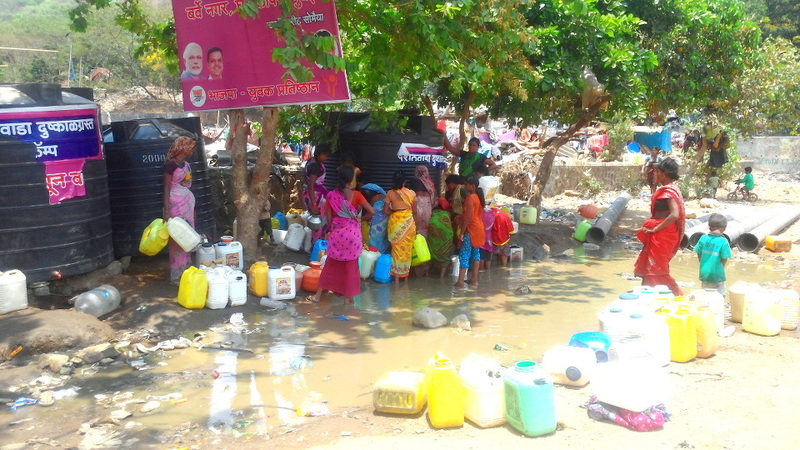 Much water supplied by the municipal water tanker to the temporary tank built for migrants at the Ghatkopar campsite is wasted. Even with 50 families, there used to be commotion at the water-filling site, the migrants said. This time, 350 families fight for water. When we met him, Chavan longed for home. He wanted to meet his parents and play with his sons. He believed he had earned about Rs 45,000 from his four-month Mumbai endeavor, three times the Rs 15,000 he earned during his four months as a farm labourer in the last monsoon crop season. Shreya Mittal and Sukanya Bhattacharya, economics graduates from Symbiosis School of Economics and interns at IndiaSpend, contributed to this survey. Next: Rural Jobs Collapse In 2016 Fuels Migration–Yashodabai’s Story. You can read part one of this story here.